Itâ€™s no secret that the manufacturing industry faces a serious recruiting problems in recent years â€“ with a predicted shortfall of 2 million workers by 2025 and an ever-increasing skills gap. A new study from Deloitte and The Manufacturing Institute takes a closer look at the industryâ€™s gender gap. Only 26 percent of the U.S. manufacturing workforce is female. Meanwhile, nationally, women make up nearly 50 percent of the workforce. The study found that by overlooking or under-recruiting women into the field, manufacturers are missing an important pool of talent that could help them close the skills gap. Two-thirds of those surveyed said they would stay in manufacturing if they were to start their careers today and would recommend them to their daughters or female relatives. Yet, 65 percent said their companies do not have an active recruitment program for potential female employees and 73 percent said women are underrepresented among the companiesâ€™ leadership ranks. Compared to other sectors, the above reasons contribute to the manufacturing gender gap, according to the study. Women arenâ€™t the only group that manufacturers need to continue targeting. A new survey from the Alcoa Foundation and SkillsUSA found 87 percent of parents believe STEM education is important for their children, yet there remains a clear disconnect between STEM education and its related careers, particularly in manufacturing. 42 percent of respondents thought the average wage for manufacturing employees was $15 per hour or less and/or donâ€™t offer medical benefits. Statistics from the U.S. Department of Commerce show that the average salary for entry-level manufacturing engineers is $60,000 and 90 percent of manufacturing workers have health insurance. Two-thirds believed that manufacturing and trade jobs donâ€™t provide opportunities for advancement and 22 percent said that manufacturing jobs do not offer innovative, intellectually stimulating work. The Brookings Institute has also weighed in on the state of the manufacturing industry. During a recent forum focusing on preparing the next generation of manufacturers through community colleges, panelists called for new more technical training in new manufacturing technologies. Be sure to check out three excerpted videos of the daylong discussion, as well as two blog posts: â€œPreparing the Next Generation of Manufacturers through Community Collegesâ€ and â€œNew Skills Needed for New Manufacturing Technologyâ€. Industry-related research is leading the news this month with new reports from the manufacturing and technology sectors. 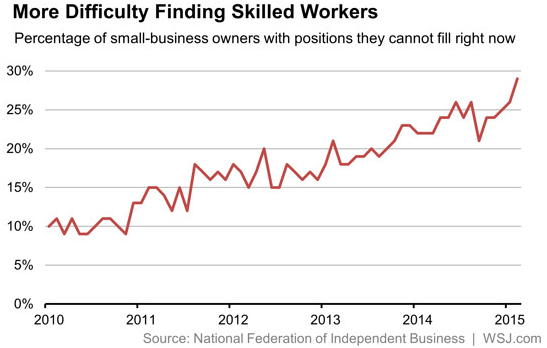 First up, new data from the National Federation of Independent Business shows that while 98 percent of small business owners say they are optimistic overall, but finding qualified workers remains a problem. In fact, 29 percent reported difficulty in finding and hiring skilled workers â€“ the highest since April 2006 â€“ and of that number, 89 percent said they are seeing few to no applicants. However, despite this struggle to attract skilled workers, only 20 percent reported raising wages over the past three months and 14 percent plan to raise them in the coming months. The Manufacturing Institute, in partnership with Deloitte, released two parallel studies that explore at the manufacturing skills gap and public perceptions of the industry. In the skills gap study, researchers predict that the United States will need to add nearly 3.5 million manufacturing jobs over the next 10 years, but roughly 2 million of those jobs will go unfilled due to a shortage in skilled labor. Also, from the Brookings Institution, a new report looks at the German manufacturing industry for shareable lessons and strategies to aid the U.S. manufacturing industry. The findings are categorized around five common myths about Millennials and three â€œuncomfortable truthsâ€. Georgetown Universityâ€™s Center for Education and the Workforce (CEW) has released a new report, â€œNursing: Supply and Demand Through 2020,â€ which says the country will soon face a shortfall of 193,000 nursing professionals. Yet despite the coming shortage and a growing interest in the nursing profession from young people, the report finds that postsecondary programs reject up to half of qualified applicants. The researchers cite inadequate faculty, facilities and clinical placements as barriers to training all of the qualified applicants. Programs providing training for Associateâ€™s Degree in Nursing rejected 51 percent of qualified applicants, while programs for a Bachelorâ€™s in Nursing rejected 37 percent. The U.S. Department of Educationâ€™s Office of Career, Technical, and Adult Education (OCTAE) has launched a new report, â€œMaking Skills Everyoneâ€™s Business: A Call to Transform Adult Learning in the United States.â€ Using data from the 2013 Survey of Adult Skills report, the report renews the call to â€œupskillâ€ those 36 million U.S. adults with low skills in numeracy, literacy and problem solving in technology-rich environments.